In the last analysis of the currency pair CHF/JPY, the issue of the downward channel formed as part of the rebound of growth traffic after flash crash was discussed. According to the scenario, the breakout from the channel took place at the top, after which a higher apex was created in the 4-hour chart. 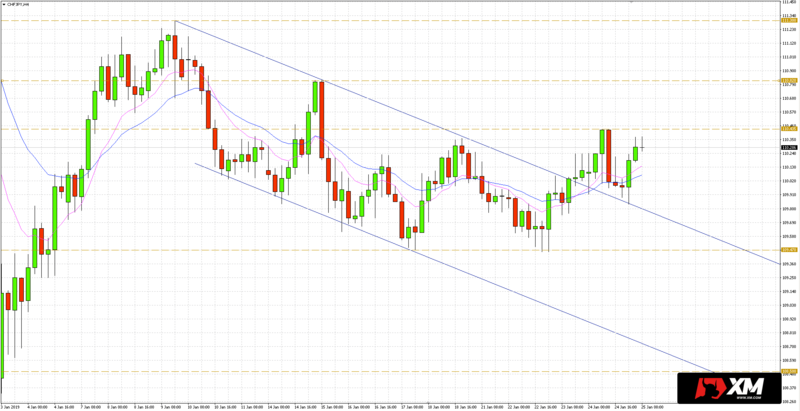 The first hours of today’s session resulted in a new test of broken resistance of the channel, which worked as support. As you can see in the chart below, the course is now heading back to its peak at 110.43. Overcoming the above mentioned level will open the way for further increases, where the key resistance is at 111.30. Below, at 110.82 there are still the maximums of 15 January, which may also hold back buyers’ appetite for a while. The pro-growth short-term focus on CHFJPY will be questioned when quotations return to the channel range. Significant horizontal support will be found near 109.47.